It was a simple enough concept - a vampire, a werewolf and a ghost live together to try to make a go of it by embracing their more human sides rather than their supernatural sides. Of course, the supernatural would always come rear its ugly head to mess up their best laid plans pretty much every episode, but what else do you expect? This is TV! The UK version of Being Human began in 2008, with the US version following a few years after in 2011. A little over a year after the UK version officially bit the dust, the US version has followed suit. While there were certainly similarities between the two versions of the show, there were also a great many differences, and that's what made them both work independently of each other. Certainly, if there had never been a UK version, the US one would have been just as compelling as it turned out to be. But there was, so inevitably there are comparisons between the two. The US one tended toward more melodrama than the UK one, which always strove to include humor in pretty much everything. 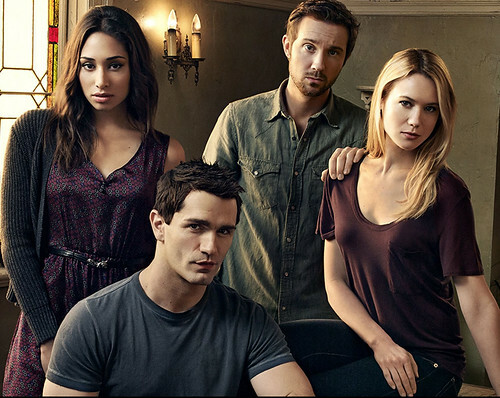 And while the US show followed its predecessor more closely in its first season, with some major plot points all playing out the same way - how ghost Annie/Sally died, werewolf George/Josh accidentally turning his girlfriend Nina/Nora into a werewolf too, vampire Mitchell/Aidan dealing with his maker and other vampires who want him more part of the fold. But that's really where the similarities ended, and thankfully so, because who really needs two versions of the exact same thing when you could easily watch the original on BBC America? Strangely, the two versions both somehow ran faster and slower than each other. In the UK, actors don't sign agreements to stick with shows for five years or more, so by the time season three came around, or series three as they call it across the pond, some of the regulars were ready to exit. This presented the show with a dilemma - what to do when one of your favorite characters decides to go? And then more, leaving only poor ghost Annie to stick around? Well, it eventually led to an entirely new trio of ghost, vampire and werewolf to shack up together, and resulted in a rather uneven season getting it there in the process, with a somewhat hokey storyline involving a baby and prophecies and sacrifices. The new trio of Hal, Tom and Alex gave a lighter flair to the proceedings that followed, which was only one more season, unfortunately. I actually quite liked the new trio, but I guess it wasn't enough to keep it going. This is unlike another UK show I loved before all the main characters left, Misfits. Ah, misfits. You became a shadow of yourself once Nathan left. Off topic! Meanwhile, back in the US, the show embraced all sorts of different supernatural craziness. Whereas Annie always steadfastly remained a ghost, Sally changed in a variety of ways. Perhaps because she was sort of boring at first without as much of the good-natured humor to her as Annie had possessed, they decided to send her down a darker path, eating other ghosts, turning human again only to go full zombie, and finally returning back to a ghost, but with magical witch powers. This transformation of Sally actually touches on something I found interesting about the US Being Human in general. As I was watching the finale, I realized that each character had actually been given the chance to be human again for some amount of time, apart from Nora, but she started the show as human, so maybe it works for her too. Anyway, yes, Josh was able to reverse his curse for a bit, and Aidan ultimately died as a mortal as well. So, they really did get to be human again, if for only short periods of time. I'm not sure I'm saying anything in particular in this article other than they were both good versions of the show. Both with their own drawbacks and strengths, but both compelling enough to keep me watching through to the end. So, without more adieu I will bid a fond farewell to these two shows, and thank them for not out-staying their welcome as some other shows tend to do nowadays, particularly in the US. It's always much more satisfying to have something end on a natural note than force it to keep going ad nauseam. So, farewell to Mitchell, George, Annie, Nora, Hal, Tom, Alex, Aidan, Josh, Sally and Nora (and the actors who portrayed them! ), along with all the supporting guests who made the shows that much better too. We shall remember you all fondly as you head into your afterlives.